Task Management Software for Entrepreneurs and Teams. Focus and complete important tasks. Week Plan has everything your team needs to plan, manage and complete tasks. Never lose sight of your most important tasks. Week Plan helps you integrate your high impact tasks into your schedule easily, so your team can focus on what matters. Every big and high impact task start small. Subtasks help you create an organized work breakdown structure to effectively manage a big task. Add as many subtasks as you want, complete with description, deadlines, priority, and more. Save tons of time by setting up repeating tasks. 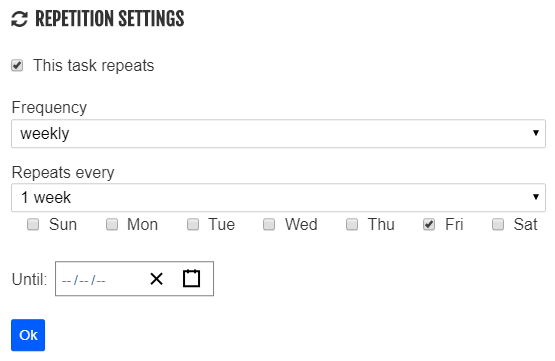 Add recurring tasks like weekly meetings and reports — they’re automatically added to the schedule. Measure the time it took you to finish a task or allocate time to your team’s tasks with the built-in time tracker. Having all your tasks in one place is critical. Arrange your tasks in a list or assign them a priority level. Then add unimportant tasks to a parking lot. Prioritize tasks by turning them into high impact tasks. Stop wasting time on unimportant stuff. Get a clear picture of what’s important and boost your team’s productivity. Tracking the progress on your task enables you to not only complete your tasks on time but to accomplish it with the efficiency. You can easily view the progress of your entire project tasks in terms of tasks completed, deliverables, and time taken. Monitor the tasks and deliverables of your entire team from a single dashboard. Get instant notification on any update and diagnose any roadblocks to avoid time delay and deadline issues.